It’s six in the morning; do you know where your wife is? She is in her pajamas, eyes half-closed, flour everywhere, a defiant mass of dough sucking viciously at her fingers as she valiantly tries to show it who is boss. She has made bread before…yeasted bread yes…but not with a recipe 10 pages and one day long. She mutters to herself…what possessed her to take this on? Two things: 1. A not-so-little group of fabulous people called the Daring Bakers and 2. 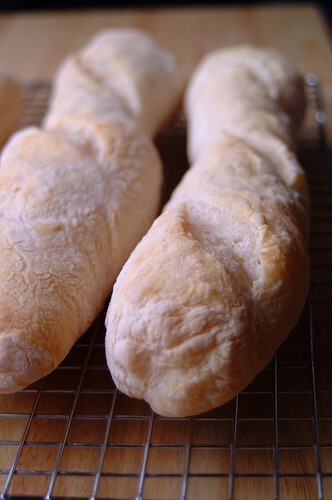 It’s Julia Child’s French bread…how could she say no? When the challenge was first posted, fear and excitement competed with each other in my brain. Yay! Bread! vs Oh no! Baguettes! Ten pages! Would I have the guts? Would I have the time? Finally, I set aside a day, set my alarm clock, and hunkered down to a day of trying to place my feet in Julia Child’s impressive footsteps. Let me tell you, early morning is not exactly my best time to take on physical challenges (ok, I really have no best time for that). And this was a physical challenge, for me at least. Because this was the first time I was going to make French bread I wanted (bravely or foolishly, you be the judge) to knead it by hand. I struggled mightily but it seemed a long time before the dough resembled anything remotely respectable. It stubbornly stuck to my hands and fingers…refusing to lose grip! But I pressed on, determined not to be beaten. After much toil, it all finally came together and I was left to the long task of waiting. This was the longest I have ever left a dough to rise (not that I have had many). At four hours for the first rise, and then two 1&1/2-hour rises after that, with a lot of slight kneading, folding, and shaping in between…this may be the most complicated bread recipe I have ever done! But like I always tell myself…I didn’t join the Daring Bakers to boil water. And did I mention the hardest part? The three hours of waiting after the bread is baked before you can even take a bite? With the smell of freshly baked bread in the air??? A challenge from start to finish. C made a roast chicken that night and we at last tried the bread. It was nice and hole-y, tasted lovely, and had a pleasant chew to it. Overall, taste-wise, I don’t think I did too badly. Perhaps it could have been less dense (any suggestions on how to make this happen are gladly welcome) but on the whole we were happy. I don’t know…but this may just be the ugliest baguettes (or batards) I have ever seen. They are the ugly stepsisters of baguettes. Sigh…they don’t even deserve a pretty French name. And I think Julia would have been perfectly fine with that.